The Officina profumo-farmaceutica Santa Maria Novella is located in Via della Scala 16 in Florence, in a part of the convent of Santa Maria Novella. Today it is considered the oldest historical pharmacy in Europe, active without interruption for nearly four centuries, and one of the oldest businesses ever. The ancient “apothecary”, today no longer pharmacy but perfumery and herbalist’s shop, is now seated in a real monumental environment, with decorations and antique furniture from various eras. It also preserves a valuable collection of scientific material such as thermometers, mortars, scales, measuring cups, etc., in addition to the fine pots pharmacy from the seventeenth to the twentieth century. It is already documented in 1381 as the Dominicans of Santa Maria Novella were selling rose water as a disinfectant, used primarily during periods of epidemics. The friars cultivated the medicinal plants in a nearby orchard, they were also distilling herbs and flowers and preparing essences, elixirs, salves and balms. The current perfumery dates back to 1612 when it was already playing the apothecary activities. The Officina entrance is a portal in pietra serena, finely carved, topped by a pediment at the center of which is placed the coat of arms of the Dominican friars, recognizable by the radiant sun, where there is the direct access to the local sale of the perfumery. The rooms that make up the Officina profumo have all different functions: the sales room, which was originally one of the convent chapels, underwent major transformations. The monks, in fact, opened the entrance on Via della Scala, so they restored and used the chapel as a warehouse because it was very deteriorated. The major renovation took place in 1848, when the growing fame of the pharmacy made necessary a suitable hall used as the reception of customers. All the works were commissioned by Fra’ Damiano Beni, one of the most important directors of the pharmacy. The place was thus divided into two areas: sales room and warehouse. The other room, la Sala Verde (the Green Room), overlooking the garden, was built to make it a private apartment, but it was never used as this purpose. This hall hosted the pyramid stoves used to distill, the stoves and the glasses. In the eighteenth century this became a reception room for the important guests. Things to note in this space today, are the portraits all directors of the Officina from 1612, year of the official foundation, onwards. The Old Pharmacy, herbalist’s shop today, is embellished by rich stucco decoration of the vaulted ceiling of the eighteenth century, with fantastic animals, sphinxes, dragons, eagles masks, garlands of fruit and roses, all motifs dear to the repertoire of the time. The museum Officina profumo Santa Maria Novella, it is now developed into what once were the production laboratories in order to give light and life to the machines once used for processing, the glasses, the ancient pottery and the vessels of brass and bronze. All the products of the Santa Maria Novella brand, now sold in all the world, are ranging from perfumes to liqueur and from essences to accessories. 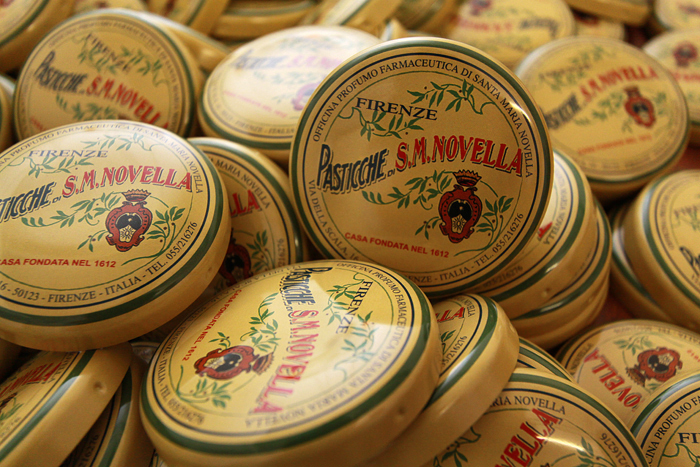 The classic and most famous product is the Acqua di S.M.Novella, Officina Profumo’s oldest fragrance. It is the perfume that Caterina de’ Medici commissioned the Dominican monks to create in 1533, and she took it with her to France when she married Enrico di Valois. For this reason this fragrance is identified as a perfume rather than with a cologne. It is a bouquet of fresh citrus notes with a base of Calabrian bergamot. The mold for the bottle is reminiscent of the glass bottles Officina has used over the last two centuries of its history, and it is used for all the other Santa Maria Novella colognes which have been created subsequently. Not only eau de toilette, Officina Profumo’s products are also alcoholic beverages like the cappuccio liquore: it has the taste and aroma of cappuccino. The main ingredients of the exclusive recipe are milk, coffee and cocoa. Smooth and creamy, it can be served with ice cream, macaroons and meringues. You can discover more items and visit the shop and the museum in Via della Scala, 16 every day from 9.00 am to 8:00 p.m. and the entrance is free. For guided tours and more informations, please visit the website or contact the museum at the link http://www.smnovella.it/contents/contatti.html. The guided tours of the garden take place every Wednesday afternoon from 2:00 to 6:00 p.m.
For further information, visit the official website of the Officina http://www.smnovella.it/contents/home.html. Next story When Florence doesn’t sleep..